Those of you out there who are among the followers of the Holy Sourdough know that the only rite of passage that allows you to qualify for a gold-plated bread-scoring tool is to make a San Francisco sourdough bread... I admit I had always wondered, somewhat skeptically, if San Francisco yeastie beasties would be much different from the ones in the Spanish plateau (the rain in Spain doesn't stay mainly in the plain...). But I've been lucky enough to get some of these bugs from my generous friend Bea... so that I could check myself. I haven't reached a definite verdict though. (...) a wild strain of yeast called Saccharomyces exiguus is used to make sourdough bread, as opposed to S. cerevisiae used in regular breads. But the complex sour flavor is not created by the wild yeast. Other bacterian organisms, specifically lactobacillus and acetobacillus, create lactic and acetic acids as they feed off the enzime-released sugar in the dough, and these are responsible for the sour flavor. 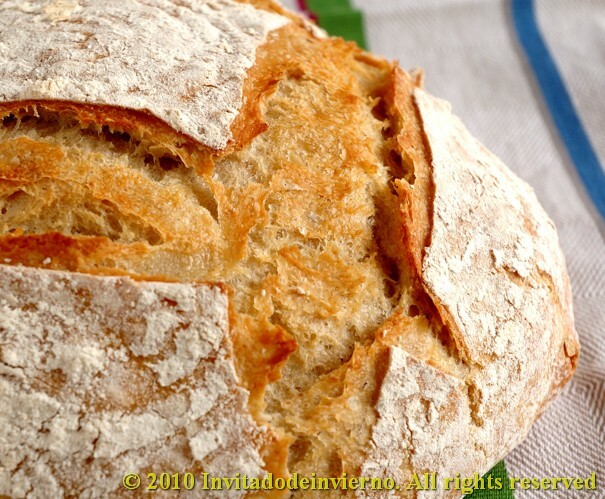 San Francisco sourdough bread, for example, has a particular type of local bacteria called Lactobacillus sanfrancisco (...) that gives this bread a different quality, more sour with a thicker crust, than any other wild-yeast bread made in other parts of the world. Mix all the ingredients and knead by hand or in a stand mixer, till the gluten is well developed. Make a ball and put it inside an oiled bowl, cover with a plastic shower cap and put in the fridge. Leave to proof overnight. Take the dough out of the fridge the next morning and leave it to temper on the counter and to further proof. It must double in bulk. It will take at least 2 hours. When doubled in bulk, tip the dough on a well floured counter and shape in whatever shape you like. Then put the formed loaf on a floured cloth, a bannetone or a large bowl, depending on the bread shape, and leave to rise again. I usually bake my loafs in a Dutch oven. Preheat the oven to 250ºC (that's the maximum reached by my oven) with the Dutch oven inside. When the loaf is doubled, take the Dutch oven out on the counter and slide the bread into it. Score it, cover with the lid and put it back into the oven. This bread hardly took 30 minutes to bake. Check the inner temperature, it should be at least 92ºC (large tears rolled down my cheeks when I opened the Dutch oven to find such a stunning bread... 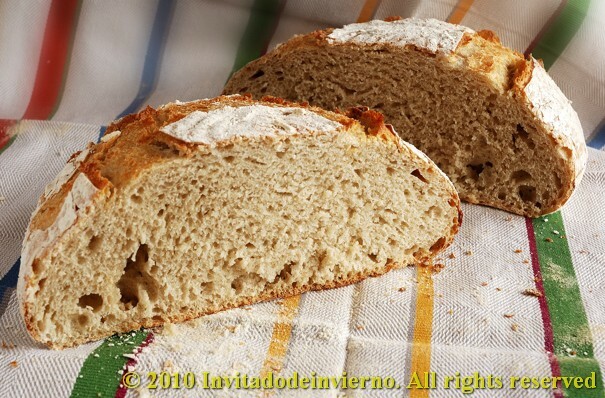 I had never baked such a beautiful bread before... so well risen, with such an appealing color...). And being that I am a studious little girl, I'm more than willing to try this sourdough again just to check if its flavor and aroma are really special or not... as many times as needed. Sorry, I must be going, I've got some baking to do. Bye. I almost forgot! I'm sending this bread to Susan's Yeastspotting... don't forget to check it tomorrow for a weekly showcase of breads! Beautiful bread!! I'd love to be a sourdough breadie, but I'm afraid I'd just eat it all day, everyday! There is nothing I want more than sourdough when I visit San Francisco and till I read this I had no idea why it always has such a unique flavor I've had no where else. Where did you get the starter from? When I was in San FRancisco last we went to Boudin's which is "the home" of the sourdough in pretty cool shapes. That's a really nice sourdough bread. The texture inside and out is perfect. I have to make my own sourdough though. Looks like you made a gorgeous loaf! When I was in San Fran last August ( I know... brrrr) I went on a foodie tour with Grace Anne Waldon and it was excellent (she was a bit odd, but she did a great tour). We went to a bakery on the tour, and she scooped out a plastic glove full of their starter for one of us and that one lucky gal was me... so I have some of the starter that is supposedly over 100 years old from that bakery. Fun, eh? It is growing and growing! oh how lucky - I which I could find some friendly bacteria, the only ones I get, end in a trip to the doctor for anti-biotics! Beautiful bread, you are a queen of bread. Gorgeous bread, what an amazing crust! now you can move here in SF and open a bakery, your bread is just perfection! 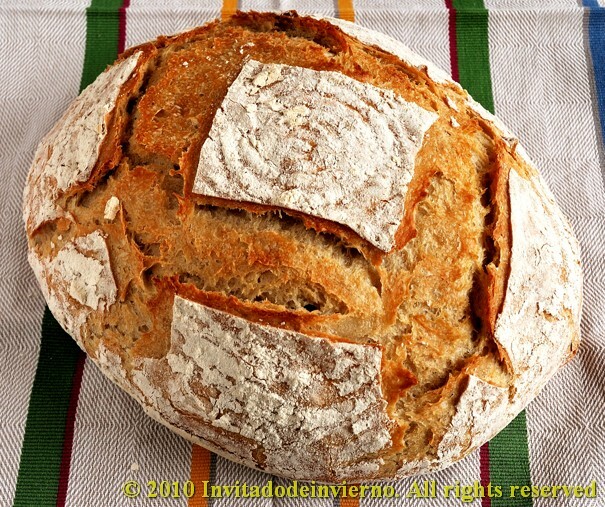 I want to make a loaf of bread that looks like that. I had a book by Peter Reinhart once and really loved it! Thanks for the inspiration to give this recipe a try! Wow, that bread really does look incredible. I agree: You need to make several more loaves just to make SURE you liked it ... and I think you should overnight me some as well. Just to get another opinion. Gorgeous bread - just begging for some clam chowder! I love both San Francisco and sourdough bread. I was actually living there for a year but I must admit that I missed the typical SF sourdough bread..I'll better go back! Have you ever tried Swedish Cupcakes? Watch the latest episode of my online cooking show and I'll show you what it is. Your bread looks amazing! You inspire me to try my hand at it. Whether the starter had a hand it in or not, those loaves are a thing of beauty. Good job! This golden crust is amazing. It is really stunning what a diffrent strain of yeast and bacteria can do to your bread! What a beautiful bread...it's a work of art! When I see the name "San Francisco Sourdough", I fondly think of Boudin's in San Francisco. Did it have an extra punch of tang in the flavor? I might just have to travel to SF to get some native sourdough. This looks too delicious! CF: congrats on your starter!! You should use it! Rose: haha, you haven't tried to make your own starter then. Marly: I must admit it was the best looking loaf I've baked so far! Linn: I like your videos, they're so cute! Joanne: you can order it online!